In the last part of our season planning series, we focus on training coordination skills. For many soccer coaches “coordination training” means exercises with cones, slalom poles and coordination ladders, but there is much more to it than just training the coordination in legs and feet. In total there are 7 soccer-specific components relating to coordination skills that one should become familiar with. You are likely to have seen scenario’s like this many times before: Messi gets the ball and starts to dribble. Here a feint, there a quick movement in order to dodge the oncoming defenders. Four opponents later and an exceptional pass into the direct path of his teammate follows. Soccer players like Lionel Messi are able to perform exceptional maneuvers game after game. In addition to the less important factors such as talent and instinct, such an ability is to a large extent due to outstanding coordinative skills that have been trained for years. “Coordination training” is certainly a term used by every coach, but which components does coordination comprise of and what relevance does this have in football? 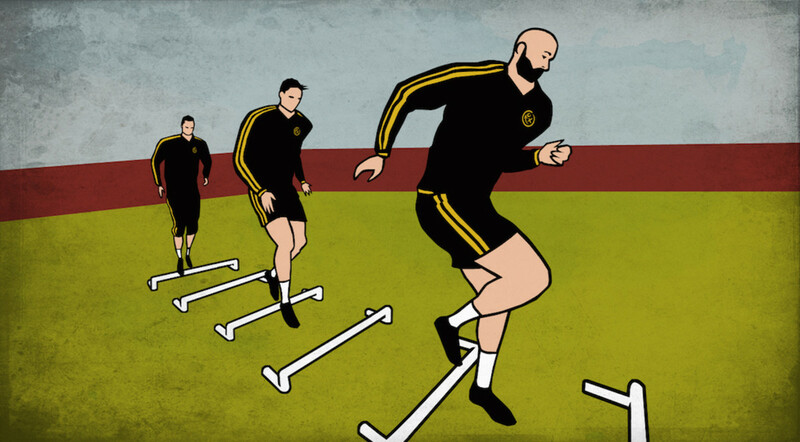 The fourth part of the season planning series aims to answer these questions as well as give you some practical tips for soccer-specific coordination training. The various degrees to which these abilities have been developed, each have different effects on the way we solve existing motion tasks. A player must, for example, whilst dribbling take many elements into consideration in order solve the situation in the best possible way. The ability to locate opponents visually is just as important as being able to locate the opponent acoustically in order to handle calls from teammates. Likewise, the player has to feel how the ball behaves on the grass, how much time is available to carry out his action and many other possible stimuli that may have an impact on the players. The groundwork for optimum handling of complex movement’s is often already laid in early childhood. When one thinks of the simple game of catch, some parallels to dribbling through a series of defenders can for example be drawn. As a matter of fact it is of great importance, specifically in coordination demanding sports, what age children start their sporting activity. Meinel and Schnabel established through several studies that children between the age of 10 and 13 can best learn and develop motor skills. In contrast to general body size the head and brain at this age are already very developed. Furthermore, certain factors such as motivation, conditional abilities, mobility and the central nervous system have a major impact on the training of coordination skills. One often notes that shorter players solve coordinative tasks better and with more elegance than do tall players. Nevertheless, each of the components of coordinative skills can be significantly improved through specific training. One of these components is the ability to differentiate. It describes the fine-tuning of all movements. With how much force to kick the ball, at which angle one’s foot should be in order for the pass to arrive where intended or how much the ball rolls on the grass. In all these issues, the ability to differentiate is in demand. This also includes all running and jumping forms as well as any ball techniques belonging to this area. In order to improve these skills different ball shapes and sizes can be used in any ball-related exercises. Players are forced to better assess the ball and accordingly adjust the necessary power needed. Shooting exercises using different techniques or targets have a similar effect. Another method is to change the terrain, such as a wet grass or uneven ground. A good reaction ability is the ability to gain awareness of a particular situation, and then to solve it as quickly and as appropriately as possible. In soccer this is required at virtually every action taken by the opposition, especially from the perspective of the goalkeeper. Any forms of competition where players must react on visual, acoustical or tactile stimuli, are suitable as a training method. In more advanced area’s, combinations of different stimuli are possible. The more complex the stimulus, the more players will be challenged and encouraged under pressure to respond properly. Another component is the conversion ability. Which involves rapid switching in the case of a required sudden change in motion. This for example is the case in a “one on one” situation, a feint shot at the goal or even a loss of the ball where the attacking team suddenly becomes the defending team. Over the past few years, Juergen Klopp has proved with Borussia Dortmund how important a well developed conversion capability can be, in that counter pressure would temporarily be perfected. In training this can be practiced, for example by alternating from offensive to defensive tactics or even with multiple goals per team. It becomes even more complex, when these tasks or the assignment of the respective goals are kept variable by optical or acoustic signals. A steady change in the number of ball contacts would further complicate these tasks. All these exercises also relate to an additional component, namely the orientation ability. Interoperability includes the seamless connection of learned patterns of movement, such as rotation about one’s axis or a dribble and a subsequent cross. In contrast rhythm ability is about the timing and the flow of these movements. Because of the close connection between these two components it is in praxis almost impossible to train them independently. Exercises of these two areas are probably most commonly associated with classic coordination training. Coordination ladders, cones, slalom poles and a subsequent combination of several forms of exercise with ball are essential here. In practice, the components of the coordinative ability are hardly ever trained individually. Often it is a combination of different aspects. As a last remaining facet of coordination training is the ability to balance. In principle, it is the foundation for all movements on the field. The maintaining or restoring of balance is demonstrated in many situations, such as during an attempted tackle, jumps to header and chases. Of particular importance is this ability in different weather conditions. Exercises with changing surfaces, such as a wobble board, balance board or a crash mat have a similar effect to that of training on a wet pitch. A stabilization training aims at the strengthening of the inner muscles, as it was already mentioned in the Article for strength training, and also has a major impact on the ability to balance. In practice, the components of coordination ability are almost never trained individually. It is often a combination of different aspects. The controlling and execution of movements as well as the defined rules within the exercise vary constantly so that new stimuli are introduced, triggering new adaptation effects. The exercises should be demanding, but not overwhelming. Here a helpful tip for the trainer would be to use a didactic method, to move from simple to more complex exercises. The progression ofcoordination training should be integrated throughout the year. It should therefore exist, in both the preparation phase and competition phase, as a complementary part of condition training within your training program. A final tip that should not be ignored! It is crucial that coordination exercises, as it concerns motor learning, are always practiced before exercises training condition and players are not fatigued. If in this context, movements are no longer correctly executed, an incorrect pattern of movements can consequently be stored and thus contribute negatively toward increasing the performance. In short, we have discussed all the important elements concerning conditional abilities and have hopefully provided you with some valuable tips. You can click here for one of many different exercises to improve coordination. Naturally, such topics are in themselves a science, that can always be further improved upon. However, it is initially important for an amateur trainer to learn a basic understanding of the various aspects of these abilities, in order to plan an “all round” training program. website, and article is really fruitful designed for me, keep up posting such articles or reviews.